Hi fellow SuperTuxKart fans, time for another update on the current development version. Don't get too excited yet; the developers are working on some cool new features, but most of the features of earlier versions needs to be rewritten as well. And I'm not covering everything that happens on the development side. But I'm starting off with one well-known feature. 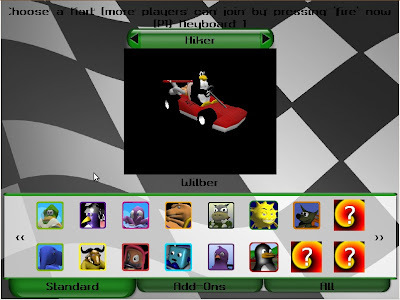 Tux is spinning around in a smooth animation, showing off his great kart, like in 0.6 and earlier. The other karts aren't ready for this yet, but it looks promising. BTW, the black rectangle behind the kart isn't supposed to be there; just a bug showing up on my computer only as far as I know. As you can see here as well, the old background picture (the checkerboard background) is now replaced by the one made by elisee. This pops up when selecting a track, showing a proof of concept. 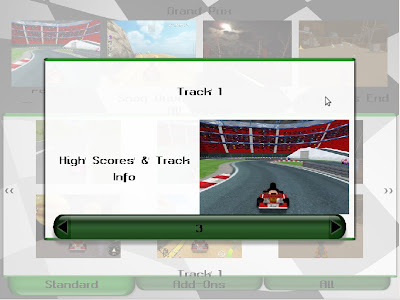 "High Scores & Track Info" will obviously be replaced with... guess what: high scores and track info. "Track 1" will be replaced with the actual name of the track. I was asked to mention that "there is now support for deciding which edges are smooth and which are not, allowing for better shading". Not completely sure what that means, but modelers wanting to create for 0.7 should bear this in mind when they are making models. Most places in the world have mid-summer now, and vacation, so that might impact somewhat on the speed of STK development. Whether it'll be in a positive way or not, time will tell, but it might turn both ways. Personally, I'll be away for a couple of weeks now, but as I'm not a developer, just a "reporter", it'll only mean that you might not see another update here in a while. When do you think you will be done?